Charming and comfortable sea front villa. Well-equipped, close to all amenities. Fabulous outdoor space including private garden, pool, balconies, barbecue area, shaded dining area and sun loungers. This stunning 3 bedroom villa is located on the one of the most beautiful spots in Protaras - on a quite seafront between Lombardi Beach, Cavo Maris Beach and Green Bay. As you walk in, there is a spacious living area with a beautiful sea view, leading out to the swimming pool. A large and fully equipped kitchen will satisfy all cooking lovers. Upstairs you will find three good size bedrooms, all with built in wardrobes and family bathroom. Two bedrooms have balconies where you can enjoy your afternoon refreshment watching the sunset. Villa Grego will definitely provide unforgettable holiday for everyone. Villa Greco is a 2 stories villa with 3 spacious bedrooms; 2 with twin beds (4 single beds) and one with a double bed; all bedrooms have built in wardrobes with 1 family bathroom upstairs, and 1 guest toilet downstairs. Air conditioning and heating in living area and all bedrooms. The ground floor is very spacious with open plan lounge, kitchen and dining area. There are TV, Satellite TV, DVD and CD player. The dining area is furnished with a dining table that comfortably seats six guests and large open plan fully equipped kitchen fridge/freezer, cooker, microwave, toaster, kettle, washing machine, dishwasher, ironing facilities, oven, extractor fan & all cooking utensils. The Living room is furnished with modern leather sofas. 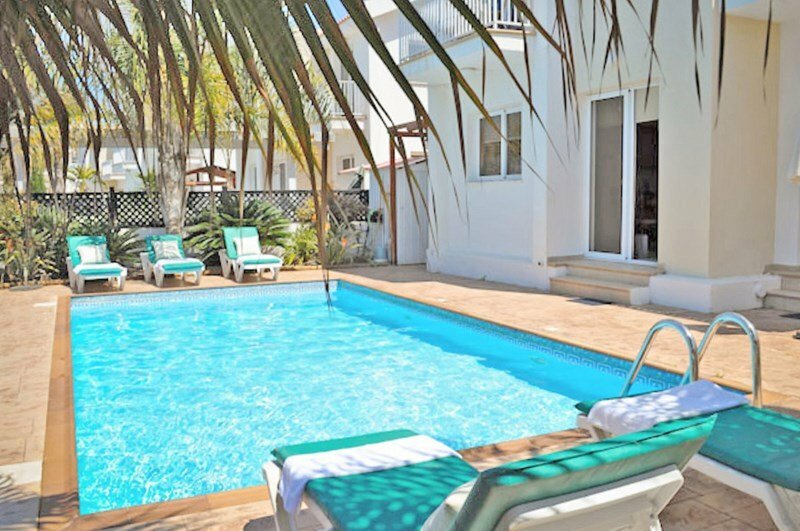 The garden is fenced for privacy with a private pool (8 x 4 meters) with sun beds, umbrella, outdoor shower and furniture.There are BBQ and garden area where you can relax in the shade whilst enjoying a nice cold drink during hot summer days. Internet access available free of charge. All necessary bed linen including bath towels are provided and with respect of your privacy, pool cleaning service is provided twice a week.